Occasionally, but not nearly as often as I would like, readers will recommend restaurants to me. Sometimes those suggested are ones I’ve reviewed within the past few years, and are therefore not yet eligible for re-review. 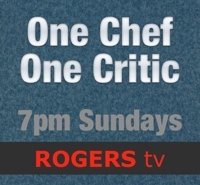 I like to keep a distance of at least two years or more between reviews of the same eatery. Fifty percent of the recommendations, by my reckoning, are for new dining spots. Unless it’s a chain with hundreds of outlets, I’ll get to the new ones faster than you can say Jacques Pépin. Such was my alacrity regarding Mogul, a new restaurant recommended to me very recently by a Facebook friend. Mogul is an Indian restaurant on Topsail Road in CBS. If you’re driving downhill, it’s easy to zip past without noticing it. 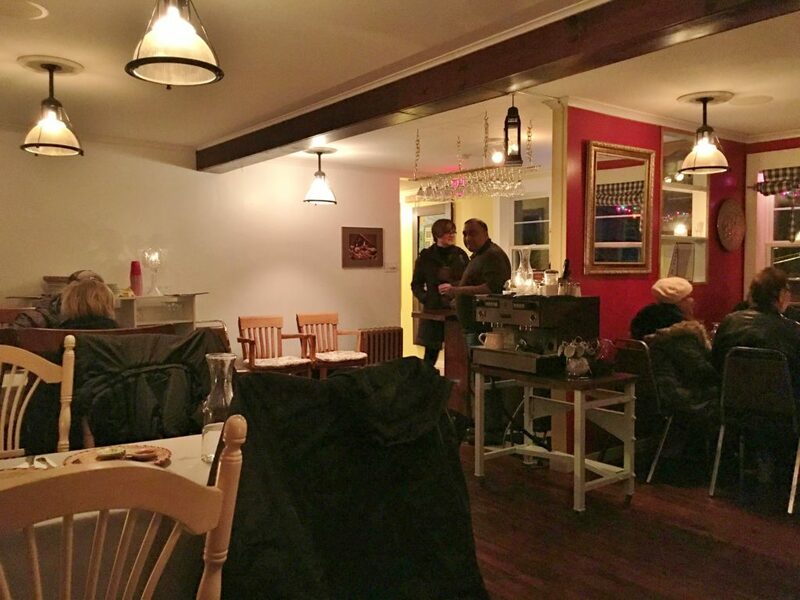 Mogul is just beyond the Woodstock – on the same side – as you head towards the post office and Topsail United Church. It stands on a rise, not a very commanding rise, and unlike a castle, this simple auberge does not intimidate. 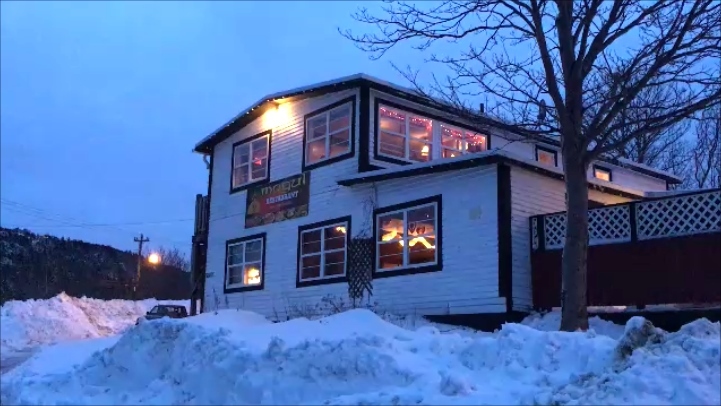 The building’s ground floor is occupied by the Topsail Breeze Tavern. Mogul can be entered at the far side. Just look for a round, red, 1950s Coca-Cola sign over the door. After a short stair climb, a narrow corridor will lead you to a dining room that seats about 30 people. At night, trendy retro utilitarian lighting is just bright enough to be able to pick out the tables and a mixture of hotel stacking chairs and traditional style wooden chairs with spoked backs. An espresso machine takes pride of place on a table at the centre of the room, although I suspect the appliance only sputters to life during brunch service on weekends. I believe there was music playing, but it was either so low or so innocuous that it didn’t make much of an impression. Our server made an impression. She appeared to be the only one on duty, and despite a full house was managing to stay out of the weeds – that’s kitchen jargon meaning, she wasn’t overwhelmed by her situation. 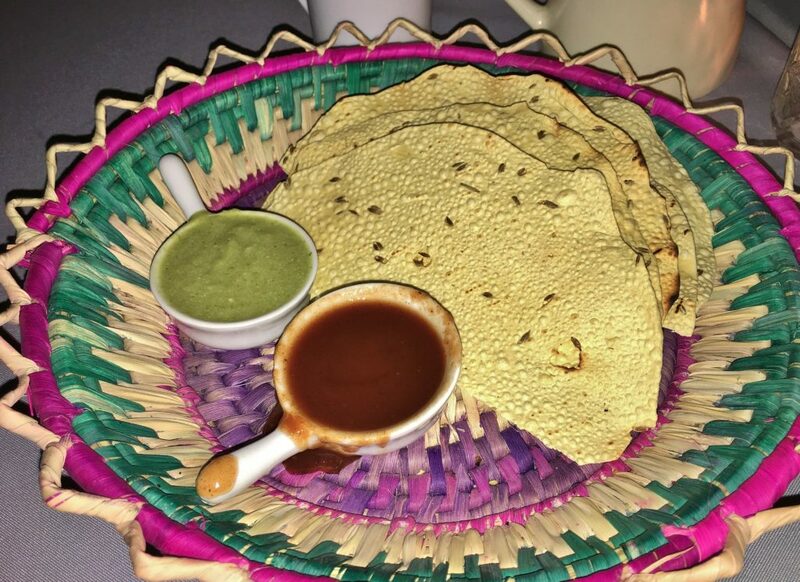 We began with papadums and chutney, every Indian restaurant’s answer to a basket of tortilla chips and salsa. I’ll take papadums and chutney any day. The warm, pebbled surface and brown edges indicated that our papadums had been freshly toasted. Flecked with cumin seeds, they had the texture of Lay’s potato chips, and came with mint cilantro chutney and tamarin chutney. The tamarin chutney was sweet and mysterious, while the mint and cilantro was a wide-open book – peppery hot and shouting cilantro. 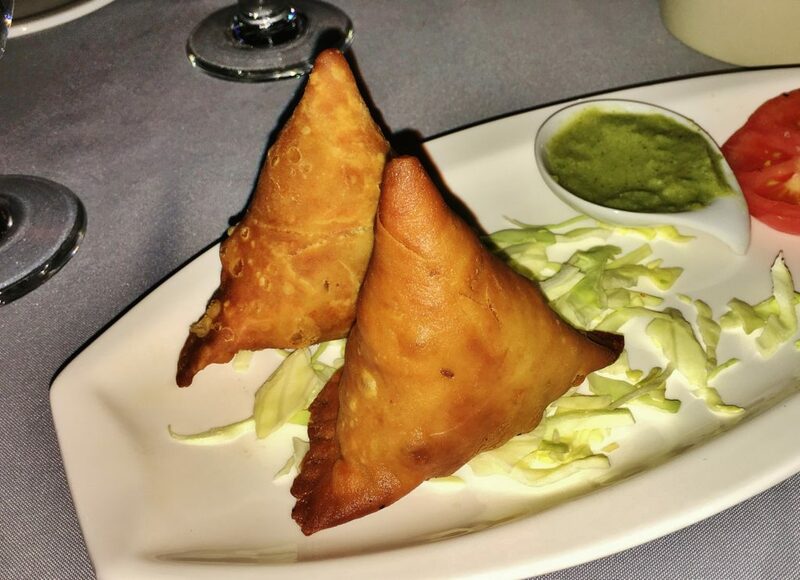 Crisp, tightly wrapped, deep fried triangle samosas were chinched, almost to bursting, with spicy ground beef. It seemed as if each tasty, roundish morsel of beef couldn’t wait to escape confinement and tumble into my mouth. Mogul’s were the best savoury samosas I’ve ever had. Hundreds of thousands of years ago, our ancestors first put flame to flesh. It created a compelling aroma and the unforgettable taste of roasted meat, cooked liquid and char. 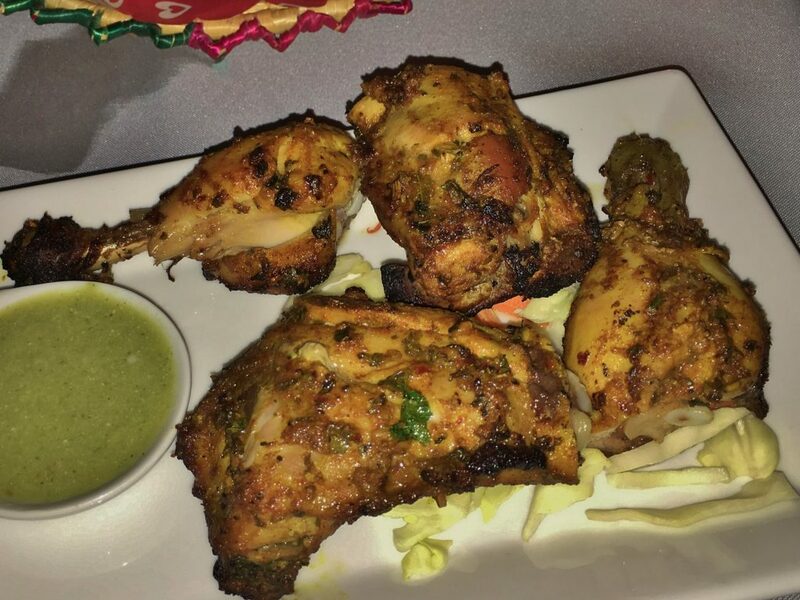 There’s no doubt the tandoori chicken from Mogul’s tandoor – a clay oven – resembled that which first turned us into a species that, thank God, cooks its food. It was dark meat chicken on the bone, blackened at the edges and covered in slick brown globules of spicy yogurt marinade and seasoning. Think of the last time you had an exceptional feed of barbequed chicken and you might be close to how Mogul’s tandoori chicken tasted. The same chutneys were served, and the sweet tamarin absolutely ruled in combination with the smoky bird. Mogul offers six different kinds of naan bread, from regular to qeema naan, a naan stuffed with minced beef. We tried the rogni naan, a fluffy variety. Puffy, soft and buttery, it was more fun to eat than plain naan in the same way a fluffy omelet is more appealing, occasionally, than a shallow omelet. Classic, rich, butter chicken, with basmati rice, was the most luxurious dish. 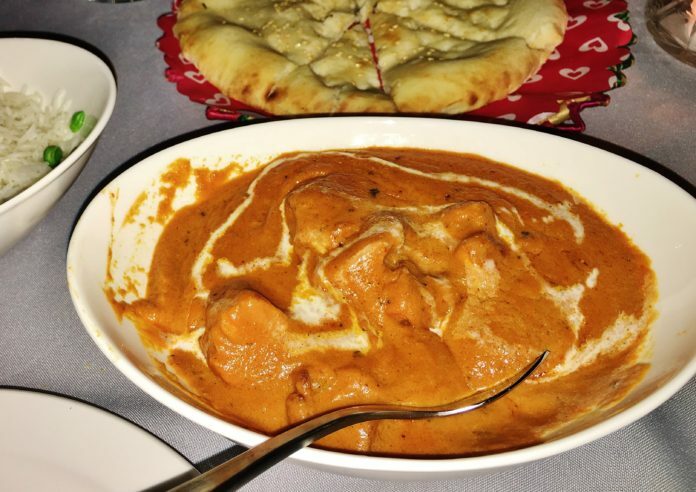 A thick, golden sauce of spiced yogurt, onions, garlic, tomato and nut paste did an effective job of visually camouflaging chunks of boneless chicken, but not the chicken’s flavour. Spicing was subtle enough for the taste of the chicken to find its way to the front. Sauce with chicken over basmati rice couldn’t have been better. 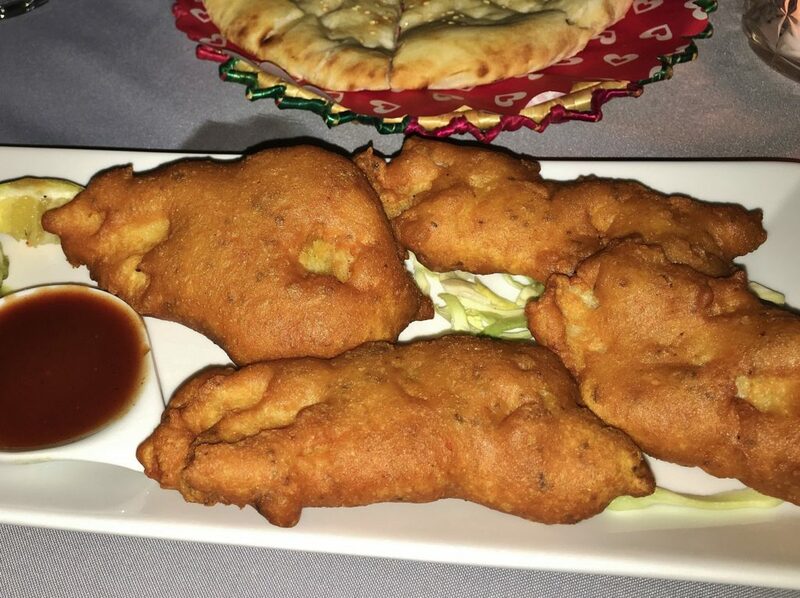 Before leaving we tried the deep fried, chickpea battered tilapia – a mild tasting white fish. It was fresh, crispy and beautifully cooked. Here I thought the peppery mint cilantro chutney made the best match. It was a pleasant accent and certainly very different from bottled tartar sauce. Mogul’s website advertised desserts and, honestly, I was looking forward to trying one. But, our server informed us that the desserts in question – kheer, gulab jamman, sohan halwa, kulfi – “shouldn’t have been on the site. It was a mistake. We’re not ready for desserts.” I found this to be strange. My advice to Mogul is, get ready. On the way home as we drove past landmarks like Marie’s at Octagon Pond, and that window factory that used to be a steel mill, it struck me how good I felt. It may have been an endorphin rush from the spicy mint and cilantro chutney, but I’m pretty sure it was something else. Too often, over past months, I’d felt unsatisfied after visiting a restaurant. Mogul was different. Despite its slight awkwardness and modest offerings, Mogul had provided us with everything a night out in a restaurant should. The food was excellent and reasonably priced, the service was friendly and sincere, and the restaurant – mostly because of its many happy patrons – felt like a place where you wanted to spend time. Well done Mogul. Price Dinner for two with tea, tax and 18 percent tip costs approximately $65. Open Monday to Friday: (Lunch) 11 a.m. to 3 p.m. (Dinner) 5:30 p.m. to 9:30 p.m. Saturday and Sunday: (Brunch) 10 a.m. to 3 p.m. (Dinner) 5 p.m. to 9:30 p.m. Parking Large parking lot. Be careful. It can be slippery in winter. Beverages Mogul is waiting for a liquor licence, so, for now it’s just soft drinks, tea and coffee. Best bets Butter chicken, tandoori chicken and samosas.